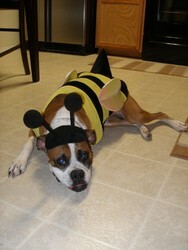 I wanted to send some more pictures of Boonie, this time in her Halloween outfit because she was just so darn cute. She is doing really really well. She doesn’t act as shy anymore and acts more and more like a boxer everyday, She is always surprising us. Well I hope you like the pictures. I wil continue to let everyone I know who is looking for a great pet to check you guys out. Have a happy holiday! I’ll talk to you soon.